Scott Snyder's underwater horror series has finally come to an end, so this seems like a good time to take a look at the series as a whole. Let's take it back about fifteen months to look at the first half of The Wake. Minor spoilers ahead. For those unfamiliar, The Wake is a ten-issue series about, for the lack of a better word, mermaids. Scary mermaids. That might sound like a ridiculous hook for a series, but don't worry, by the end of the first issue any doubts about this series monster being threatening enough are thoroughly erased. Our main character is Dr. Lee Archer, a marine biologist who is approached by a member of Homeland Security, asking her to come study a strange sound recorded in Alaska. Archer's reluctance to accept the offer is quickly overpowered, as Agent Cruz quickly makes her an offer too attractive to refuse. Before long, however, the truth of what Cruz wants with Archer is brought to the surface, as she is taken to an underwater rig along with several other experts, a professor of Folklore, a former colleague whom Archer has history with, and an engineer with a talent for hunting down dangerous (and endangered) species. As it turns out, they'd captured a lot more than a mysterious sound clip, they'd captured a living monster (later referred to as a "mer"). With no idea what the creature is, or what it's capable of, Cruz brought the group down there in hopes that they could tell him what he's dealing with. Of course, when the creature gets loose, the scientists, soldiers, and employees on the rig find themselves fighting just to stay alive. The most immediate comparison which jumps to mind when reading The Wake is John Carpenter's The Thing from 1982. It's certainly not the only time the premise of "scientists stuck on an isolated base with a monster" has been done, but it's arguably the most influential and best example. Indeed, Snyder manages to capture some of the best elements of The Thing here, intentionally or not (although I'd be willing to bet it was). The feeling of isolation, and the suspense of not knowing where or when the creature might strike work in the book's favor. The characters of the book, as well, feel more like regular people (albeit very smart ones) than action heroes, save for those who were introduced as such. At the same time, this is a very unique story as well. Whereas The Thing mined horror from the unease of knowing who or what might be the monster, not knowing who to trust, The Wake thrives on just how familiar (and yet at the same time foreign) the mer is, alongside a story which manages to find new twists even when it doesn't seem possible for things to get any more shocking. The ending of the first half had my jaw on the floor. A large part of what makes this series work are the characters. Archer is well developed and alive, but the side characters also feel fleshed out, even ones which I feared at the start would wind up being written as nothing more than archetypes. They also manage to dodge a lot of horror cliches, which makes the characters come across as really smart. Early on in the series, someone suggests they just leave the base where the monster is loose, and instead of finding some reason for them to stay and try to fight the monster off, the other characters simply agree. The art also really shines in this series. Art for horror is hard to do right, it's difficult to find a balance that manages to scare without going too far into the realms of gore, camp, or darkness. Sean Murphy absolutely owns the art here, however. The art itself is gorgeous, but beyond that, it shows excellent restraint, using darkness for effect, rather than as a crutch, providing blood where appropriate, but not bathing in it, and using a washed out color palette as opposed to grays and blacks everywhere. I loved the art in this series. Nearly everything about The Wake: Part One works, with perfect pacing, great writing, and phenomenal art. There is, however, one sticking point which stands out to me enough to talk about. Honestly, I feel like I should probably put a spoiler warning or something here, but I'm literally going to be talking about the first page of the book, so, uh, I suppose it can't be avoided. Throughout the first half of the series, the book cuts away from our main story several times to focus on seemingly unrelated moments (which almost feel like they belong in another book), provided without any context. Everything from a woman and a dolphin exploring a flooded cityscape, to primitive men using a strange inexplicable device, to a foreign object striking the Earth from space, causing an explosion. After finishing the series, in order to prepare for writing this review, I went back and reread all ten issues in a single sitting, and I can now confirm that these bizarre sequences do all, in fact, make sense on a second reading. While they were interesting to see again in that context, they still feel rather unnecessary. The foreshadowing they provide to some reveals later on doesn't seem to justify what, at some points, amounts to spoilers for your own series, and momentarily breaking the pacing of the main story. When I first read the series, I would always feel a little bit disappointed when I got to one of these out of context moments, because I would rather have just kept reading the main story uninterrupted. 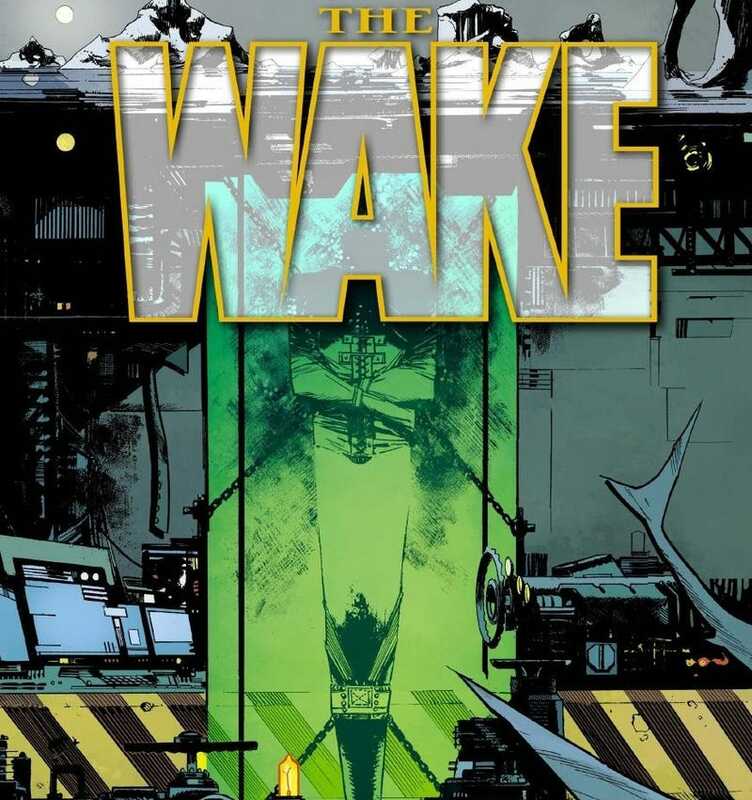 With that said, The Wake: Part One is a brilliant series, and I highly recommend either checking out the trade collection, or the upcoming hardcover of both halves. It's a great horror story, and I think I'll be pulling it out for rereads for years to come.